No Freight Is Too Big Or Small – Freight Logistics, Inc.
We manage shipments of all sizes, and we aren’t afraid of large freight. 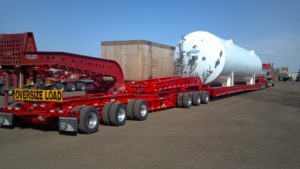 Whether you have heavy haul, over dimensional or high value freight, we can handle it for you. Some transportation brokers don’t work with large freight, and when the situation comes up, they may have to turn you away or offer less than exceptional service. But that’s not our team. We have account representatives who specialize in large freight and know how it works and best practices. They live and breathe specialized equipment services and will happily help you with whatever you need. If you want a new transportation broker this year, look no further. We are ready and capable to handle any size freight shipment, and our team loves the chance to learn about your business and find the best solution for you. Don’t stress over your freight shipments anymore. Give us a call today for more information, and we’ll get your shipment loaded and moving!